Legumes of the Fabaceae family of flowering plants have the unique capacity to form a symbiotic N2-fixing symbiosis with soil-inhabiting root nodule bacteria (RNB). This symbiosis supplies leguminous species with the essential bioavailable nitrogen that could otherwise not be obtained from soils that are inherently infertile. The agricultural region of south-west Western Australia contains such impoverished soils and the successful establishment of effective legume-RNB symbioses has been exploited to drive plant and animal productivity in this landscape without the reliance on nitrogenous fertilizer [1,2]. This landscape’s rainfall patterns appear to be changing, from a dry Mediterranean-type distribution to a generally reduced annual rainfall with a less predictable distribution . Due to changes in rainfall patterns, the reproduction of the commercially used annual legume species is challenged. Perennial species might be more able to adapt to climate change, though few commercial perennial forage legumes are adapted to the acid and infertile soils encountered in the region . Therefore, deep-rooted herbaceous perennial legumes including Rhynchosia and Lebeckia species adapted to acid and infertile soils have been investigated for use in this Australian agricultural setting [2,4,5]. The genus Lebeckia Thunb. is part of the Crotalarieae tribe, and refers to a group of 33 species of papilionoid legumes that are endemic to the southern and western parts of South Africa, which have similar soil and climate conditions to Western Australia [6,7]. This genus has recently been revised and is now subdivided into several sections, including Lebeckia s.s., Calobota and Wiborgiella . The Lebeckia s.s. section, which includes L. ambigua, can easily be distinguished from other species by their acicular leaves and 5+5 anther arrangement [7-9]. In four expeditions to the Western Cape of South Africa, between 2002 and 2007, nodules and seeds of Lebeckia ambigua were collected and stored . 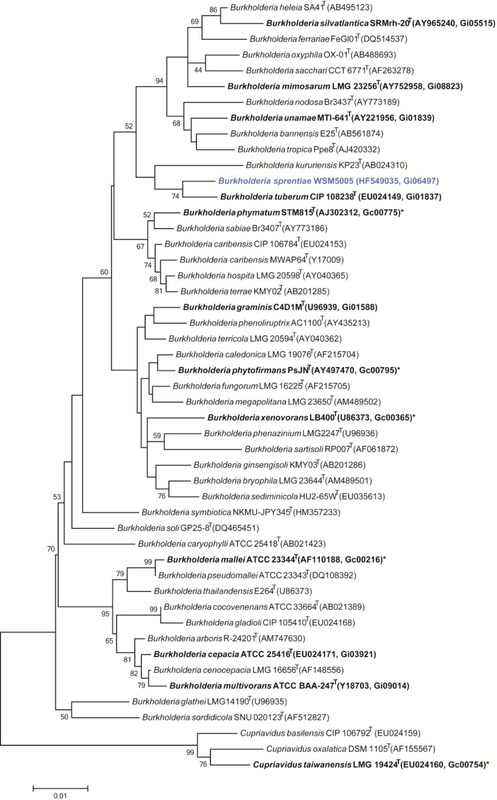 The isolation of RNB from these nodules gave rise to a collection of 23 microsymbionts that clustered into five groups within the genus Burkholderia . Unlike most of the previously studied rhizobial Burkholderia strains, this South African group appears to be associated with papilionoid forage legumes (rather than Mimosa spp.). One of these Burkholderia strains has now been designated as the type strain of the new species “Burkholderia sprentiae” strain WSM5005T . This isolate effectively nodulates Lebeckia ambigua and L. sepiaria . Here we present a summary classification and a set of general features for “Burkholderia sprentiae” strain WSM5005T together with the description of the complete genome sequence and its annotation. “Burkholderia sprentiae” strain WSM5005T is a motile, Gram-negative, non-spore-forming rod (Figure 1, left and center panels) in the order Burkholderiales of the class Betaproteobacteria . It is fast growing, forming 2-4 mm diameter colonies within 2-3 days when grown on half Lupin Agar (½LA)  at 28°C. Colonies on ½LA are white-opaque, slightly domed, moderately mucoid with smooth margins (Figure 1, right panel). Images of “Burkholderia sprentiae” strain WSM5005T using scanning (Left) and transmission (Center) electron microscopy and the colony morphology on a solid medium (Right). Minimum Information about the Genome Sequence (MIGS) is provided in Table 1. Figure 2 shows the phylogenetic relationship of “Burkholderia sprentiae” strain WSM5005T in a 16S rRNA sequence based tree. This strain clusters closest to Burkholderia tuberum STM678T (CIP 108238T) and Burkholderia kururiensis KP23T with 98.2% and 96.9% sequence identity, respectively. Classification and general features of “Burkholderia sprentiae” strain WSM5005T according to the MIGS recommendations [12,13]. Phylogenetic tree showing the relationships of “Burkholderia sprentiae” strain WSM5005T (shown in blue print) with some of the bacteria in the order Burkholderiales based on aligned sequences of the 16S rRNA gene (1,322 bp internal region). All sites were informative and there were no gap-containing sites. Phylogenetic analyses were performed using MEGA, version 5.05 . The tree was built using the maximum likelihood method with the General Time Reversible model. Bootstrap analysis  with 500 replicates was performed to assess the support of the clusters. Type strains are indicated with a superscript T. Strains with a genome sequencing project registered in GOLD  are in bold print and the GOLD ID is mentioned after the accession number. Published genomes are designated with an asterisk. “Burkholderia sprentiae” strain WSM5005T is part of a cadre of Burkholderia strains that were assessed for nodulation and nitrogen fixation on three separate L. ambigua genotypes (CRSLAM-37, CRSLAM-39 and CRSLAM-41) and on L. sepiaria . Representatives of this group of nodule bacteria are generally Nod+ and Fix- on Macroptillium atropurpureum and appear to have a very narrow host range for symbiosis. They belong to a group of Burkholderia strains that nodulate papilionoid forage legumes rather than the classical Burkholderia hosts Mimosa spp. (Mimosoideae) . “Burkholderia sprentiae” strain WSM5005T was grown to mid logarithmic phase in TY rich medium  on a gyratory shaker at 28°C. DNA was isolated from 60 mL of cells using a CTAB (Cetyl trimethyl ammonium bromide) bacterial genomic DNA isolation method . The genome of “Burkholderia sprentiae” strain WSM5005T was sequenced at the Joint Genome Institute (JGI) using a combination of Illumina  and 454 technologies . An Illumina GAii shotgun library which generated 76,247,610 reads totaling 5,794.8 Mb, and a paired end 454 library with an average insert size of 13 kb which generated 612,483 reads totaling 112.9 Mb of 454 data were generated for this genome. All general aspects of library construction and sequencing performed at the JGI can be found at . The initial draft assembly contained 420 contigs in 8 scaffolds. The 454 paired end data was assembled with Newbler, version 2.3. The Newbler consensus sequences were computationally shredded into 2 kb overlapping fake reads (shreds). Illumina sequencing data were assembled with VELVET, version 1.0.13 , and the consensus sequences were computationally shredded into 1.5 kb overlapping fake reads (shreds). We integrated the 454 Newbler consensus shreds, the Illumina VELVET consensus shreds and the read pairs in the 454 paired end library using parallel phrap, version SPS - 4.24 (High Performance Software, LLC). The software Consed [34-36] was used in the following finishing process. Illumina data was used to correct potential base errors and increase consensus quality using the software Polisher developed at JGI (Alla Lapidus, unpublished). Possible mis-assemblies were corrected using gapResolution (Cliff Han, unpublished), Dupfinisher , or sequencing cloned bridging PCR fragments with subcloning. Gaps between contigs were closed by editing in Consed, by PCR and by Bubble PCR (J-F Cheng, unpublished) primer walks. A total of 352 additional reactions were necessary to close gaps and to raise the quality of the finished sequence. The estimated genome size is 7.8 Mb and the final assembly is based on 65.2 Mb of 454 draft data which provides an average 8.4× coverage of the genome and 2,340 Mb of Illumina draft data which provides an average 300× coverage of the genome. The genome is 7,761,063 nucleotides with 63.18% GC content (Table 3) and comprised of 8 scaffolds of 236 contigs. From a total of 7,223 genes, 7,147 were protein encoding and 76 RNA only encoding genes. Within the genome, 377 pseudogenes were also identified. The majority of genes (76.16%) were assigned a putative function whilst the remaining genes were annotated as hypothetical. 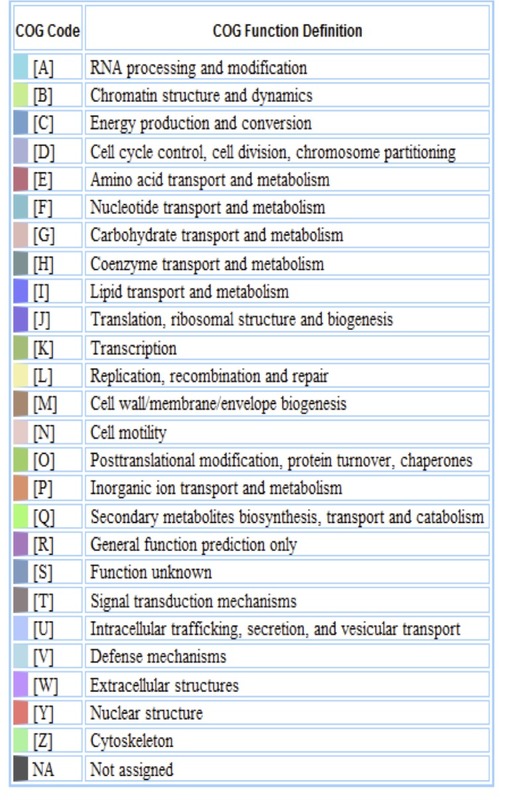 The distribution of genes into COGs functional categories is presented in Table 4, Figure 3 and Figure 4. Genome Statistics for “Burkholderia sprentiae” strain WSM5005T. Number of protein coding genes of “Burkholderia sprentiae” strain WSM5005T associated with the general COG functional categories. Graphical map of the chromosome of “Burkholderia sprentiae” strain WSM5005T. From the bottom to the top of each scaffold: Genes on forward strand (color by COG categories as denoted by the IMG platform), Genes on reverse strand (color by COG categories), RNA genes (tRNAs green, sRNAs red, other RNAs black), GC content, GC skew. Color code for Figure 3. George RJ, Speed RJ, Simons JA, Smith RH, Ferdowsian R, Raper GP, Bennett DL. Long-term groundwater trends and their impact on the future extent of dryland salinity in Western Australia in a varibale climate. Salinity Forum 2008. 2008. De Meyer SE, Cnockaert M, Ardley J, Maker G, Yates RJ, Howieson JG and Vandamme P. Burkholderia sprentiae sp. nov. isolated from Lebeckia ambigua root nodules from South Africa. Int J Syst Evol Microbiol. (In press).